With it looking increasingly likely that van Persie has played his last game for the club, now seemed as good a time as any to compare the two prolific strikers on their most prolific seasons. Each had a massive impact on the team and essentially where they finished, and below i’ll try and illustrate who was most important, and who was the better man for the big occasion. 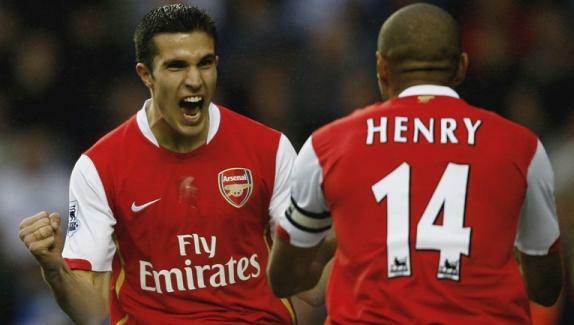 The seasons in question are 2011-12 for Robin van Persie and 2003-04 for Thierry Henry. Whilst Henry’s Arsenal famously went the season unbeaten in 2003-04, van Persie’s Arsenal looked like relegation contenders at times, before steadying the ship and finishing a very respectable 3rd. So moving onto the numbers, at first glance it’s pretty even. Both started 37 games, with van Persie also making a substitute appearance to make the whole 38 game season. That he appeared in every game is borderline miraculous given his past. Both hit 30 goals at a rate of 0.81 goals per game for the Frenchman and 0.79 for the Dutchey – we’ll call that a draw. Similarly, both scored in 20 games. Where the differences start to show is in the range of opponents scored against. Whilst van Persie had a very decent 7 goals in 10 games against the Top 6, Henry had an even better 10 in 10. Nice. More on that later. Aside from the big games, van Persie specialised in punishing the mid table teams resulting in an averaged rank opponent per goal of 11.77 compared to his former captain’s 11.93 – driven by 14 goals against the Bottom 6. Once again, based on the average, they’re pretty much neck and neck. in wins against London rivals Chelsea and Spurs. Henry on the other hand only managed the one assist against the Top 6 teams, a decisive one too, in the 2-1 win over a Chelsea team that would go on to finish second in Abramovich’s first season in charge. Most of Henry’s assists came against the teams in mid table, leading to his better average of 10.77 compared to van Persie’s 12.89. Last season saw a very impressive 7 league goals against the top teams for van Persie, including that memorable hat trick in the 5-3 win at Chelsea, a game that also saw him provide and assist, in what turned out to be a season changing performance for the 2011-12 Gunners. Those seven goals were second only to Wayne Rooney’s eight strikes against the Top 6, although based on position at the time of play, van Persie was top. As good as 7 goals in 10 games against the league’s best opposition, it’s here where Henry really shines through. He had a goal per game record versus the Top 6, also scoring a memorable hat trick – at home to Liverpool in a 4-2 win that Jamie Carragher still has nightmares about. It wasn’t just Liverpool that suffered though, Henry scored against every team in 2nd to 5th place, showing a consistancy that drove the team on to the unbeaten season. Both manage plenty of shots against the decent opposition, although the Home and Away split predictably shows a significant difference. Okay, they’ve both scored 30 goals and set up nine others for their team mates, but what about their importance in terms of the over team stats. Firstly is the percentage of team goals that each scored. To my surprise, I recently discovered that the great Invincibles team of 2003-04 only scored 73 league goals. Also surprising is that van Persie’s Arsenal team actually outscored them (albeit by one goal) despite winning 20 less points and finishing 19 points behind the teams in first and second. Of the team goals, it’s pretty even – Henry scored 41% of the team’s goals in 2003-04, whilst van Persie also achieved this, with a bit of rounding involved. Once again, the two are incredibly equal. 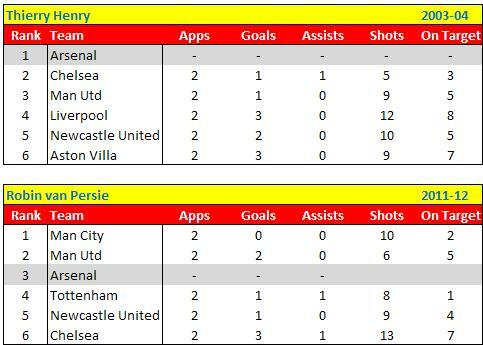 Where van Persie outshines Henry though is the points won from his goals. It’s not a perfect science but if you take away each players goals from the final scoreline then you’re left with the difference they make. Henry has a very decent 20 points from his 30 league goals, which worked out to be 22% of Arsenal’s 90 points that season, whereas van Persie’s 24 point haul is not only better, but it’s more crucial to the team, being worth a massive 34% of 2011-12 Arsenal’s points tally. It’s fair to say that both made a massive contribution, Henry in winning the title, and van Persie in keeping the team in the coveted Champions League places. Obviously Henry did it in a better team, not only were they champions, but they went the season unbeaten in the league. He had the likes of Vieira, Pires, Ljungberg, Bergkamp, Reyes and others around him, helping him score, and also scoring the chances he created. That’s not to say that it was an unfair advantage on van Persie though. The Dutchman got to play as the lone striker, or the central point of a 4-3-3 depending on your interpretation of Arsenal’s line up. As a result, most of the play and chances went through him, making it appear as though Arsenal were a one man team for large parts of the season. In terms of the opponents, Chelsea won the Champions League in 2012, yet only finished 6th in the Premier League, whilst Manchester United and Manchester City both went out in the group stages. Henry’s Arsenal face a Man Utd that reached the last 16, and a Chelsea that beat them on the way to the Semi Final. The difference between 1st and 6th in 2003-04 was 34 points, compared to just 25 points in 2011-12. In short, the van Persie season was more competitive. I honestly don’t write these pieces with the intention of declaring a draw everytime, but it’s very hard to avoid that conclusion when looking at the above data. I know stats only tell half of the story, but on this occasion, I think it’s a fitting result. Henry inspired his team to win the league title, whilst going the season unbeaten. That team has since been named the greatest in the history of the Premier League and it was very much Henry’s influence that was the biggest factor. Robin van Persie on the other hand dragged what has widely been described as the weakest team of Wenger’s era, into 3rd place and the all important automatic Champions League spot. Both proved essential in their teams outcome. 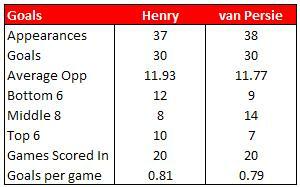 In terms of big game performances, Henry just about edges it, but will always have a slight cloud hanging over him for the biggest of games – the finals of major competitions, but in just comparing their league seasons, he comes out on top, only for van Persie to lead on the points won. So all in all, whilst there’s no real comparison on their full Arsenal careers (especially with van Persie’s behaviour after the season), it’s fair to say that they were both instrumental in their teams fortunes. As van Persie has decided to leave, we’ll never know if he could have maintained that level for more than one year, but for one season only, he could live with the King.